I am still home. Lea headed off to Lubbock this morning to spend the weekend with Greg. I kept Catey (Lea’s 6 yo. daughter) today, while Brian and Brayton (Lea’s husband and oldest son) worked to clean up the mess at our shop. 70 mph straight winds ripped off a good portion of our roof, and it’s quite a mess. The first report from Lubbock today came from Terry May, who has been staying with Greg this week. What a great friend. He headed home today, and before he left he told Greg he was leaving, and Greg opened his eyes, and Terry told him he would see him when he comes home. He said he thought he nodded at him, but he wasn’t completely sure. Well, when Lea got there, she confirmed that he is nodding a little now, in response to questions. She said it’s a little dip of the chin. He was really moving both of his arms around again today. She said he is using his right arm a lot, and even rubbing at this eyes and the corner of his mouth with it, and scratching at his nose. She said once, he even had both index fingers stuck in his ears. We aren’t sure what that was about. She said it appears that he is trying to use his shoulders some, to readjust himself. Lea was saying a prayer with him, and when she said Amen, one of the pulmonologists said “amen” with her, and nearly scared her to death. She hadn’t even realized he had come in. He said he is breathing totally on his own, just a little pressure support from vent, and said he is looking better every day. When he left the room, he raised his hand up and said “we’ll keep the prayers going”! The nephrologist came by later, and they started the IV fluids this evening. He said if his numbers continue to decrease (creatinine, BUN), that he may get to go to a Tues/Thurs dialysis instead of Mon/Wed/Fri. Will just have to wait and see what the labs look like on Monday. 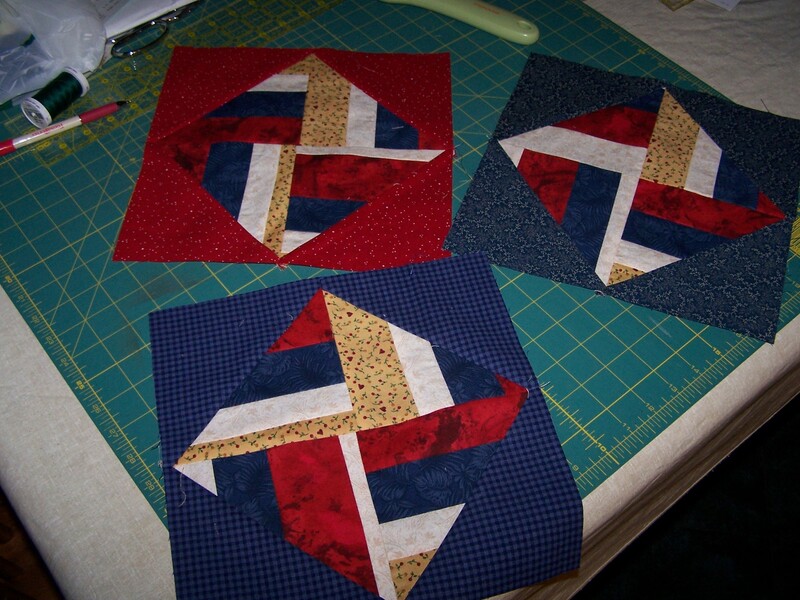 Here is a pic of the rest of the blocks I have completed, thus far. Today sure has seemed like it was more good news than bad, and for right now, I will be thankful for that, and keep hoping and praying for more of it! Praying the positives keep happening for Greg! Randi, it’s so wonderful to hear some good news! I’m praying each day for Greg. Praying with you, honey. 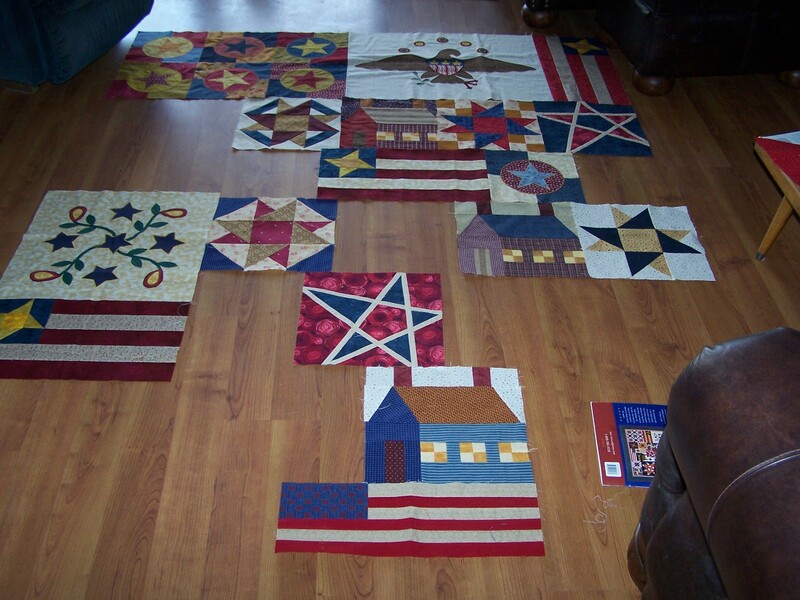 Great, great quilt!! He will love it. I love the Victory Quilt!! I pray the good news keeps coming!! I’m so pleased you took the time to let us know. Good news, good news, good news! Thank you so much for keeping us updated. I’m thankful to hear the good news and am praying it will continue. It sounds like a good time with Catey. She’ll remember it fondly. He will deserve a victory quilt for sure! I’m so glad you got you got to have some fun and glad to hear there is improvements. Still praying for all. Sorry about the mess the wind caused. Thank you Lord-encouraging news. Will continue to pray for Greg and you. Good news!! Well, except for the roof part! Greg is going to love his Victory Quilt! Hugs…. YAY! A good day and hopes for each day going forward to be even better. Step by step on the road to recovery! Hugs to you and Greg! I smiled all the way threw this post! Love the victory quilt! Perfect timing to be making it. Praise God! All good news welcome – prayers ongoing.